When I was watching Ratatouille the other night, I watched most of the credits because I enjoyed the 2D animation that ran during them. Shortly after the animation ended, I noticed the image to the left scroll by. 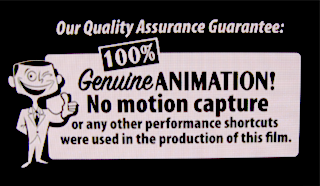 I knew that Pixar animated everything by hand and did not use motion capture, but I find it interesting that they make it a guarantee. I hope that they stick to their guarantee as an animation studio, because it lends a certain “hand-crafted” charm to their movies that cannot be replaced by motion capture. The animations are actually works of art, as opposed to just virtual representations of data captured from the real world.